Who likes the sound of a new set of crisp bedding. 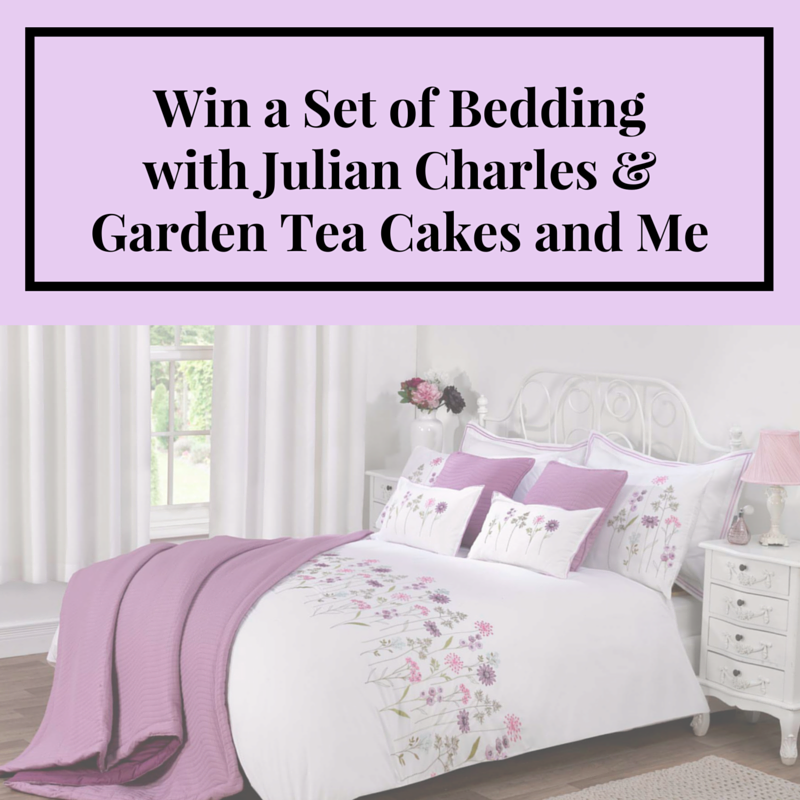 I have teamed together with Julian Charles to celebrate Garden Tea Cakes and Me winning the Best Dressed Interiors Blogger competition they recently ran. Not only does that mean I get to have a lovely badge for my blogs sidebar, but I also get to enjoy a free shopping spree. Now it seems a little unfair that I get all the fun, and Julian Charles agree. One lucky reader of my blog will get the chance to win a set of beautiful bedding of their choice from 3 gorgeous designs - Cleo, Evelyn or Imogen. Which set of bedding would you like to win? leave your answer as a blog comment and confirm your entry using the rafflecopter widget below, this will then release the additional entry tasks. If any of the links are not working on the widget leave me a comment or tweet me. Closes 20 May 2016. Winner must respond within twenty days of being notified, after which time a new winner will be selected. UK entrants only. For Terms and Conditions click the link on the Rafflecopter widget. I love the Sasha Pink Luxury Floral Duvet Set! I really love the Cleo set. The Cleo set is beautiful..
Esme Blue Luxury Jacquard Duvet Cover is beautiful. I like the Evelyn Duckegg Floral Printed Luxury Cotton Duvet Cover. I like the Mayfair White 300 Thread Count 100% Egyptian Cotton products. Lovely. I adore the Ashford Silver Luxury Duvet Set. My favourite has to be the Neta Navy Luxury Bedding Set! I love the blue tones! i like the Harrison Silver Luxury Jacquard Duvet Cover. I love the Evelyn set. I really like the Kennedy Charcoal Gray. I'd love the Cleo set please. Evelyn duck egg please - it is beautiful! I love the Evelyn Bedding Set :) very pretty! I love the bedding, particularly the cleo set. Love the pink sash a floral set - so fresh looking. Really love the Imogen set!! Purple is my favourite colour!! I love the Evelyn bedding! I really like the Newquay Blue Luxury Cotton Duvet Cover. It is just to my taste. I love the Evelyn - its very pretty! Charlotte Wilde! Thanks for persevering and entering the comp Charlotte - good luck! I love the evelyn set! Love the zeta navy bed in a bag such a lovely simple design. I love the Cleo set! The Ashford Silver Luxury duvet set because it would suit my bedroom colour scheme and it comes in Super King size. Hard choice there are 3 I love but if I had to narrow it down it would be the Finesse Charcoal Embroidered Luxury Duvet Cover. Evelyn - of these three. Summery florals and fresh. I love the Imogen set. I like the Cleo set. I like the Evelyn set, it's so pretty. The Cleo set is beautiful. I really like it. I love the Florence Natural Luxury Jacquard! Thanks for all your entries so far - keep them coming and good luck to everyone! I love the Newquay Blue Luxury Cotton Duvet Cover. It would just match my bedroom - by - the - sea! Oh this is so difficult as they're all so lovely but I think I would have to choose Imogen. The Ashford Silver Luxury Duvet Set is lovely. Kennedy Charcoal. I like checks. I really like the Hydrangea Soft green Jacquard Duvet Cover. I love green as it always feels like spring/summer. I think the Evelyn set is absolutely gorgeous! Duck egg blue is my favourite shade of blue and the floral design is so pretty! - Thank you for the opportunity to win this fantastic prize, good luck everybody. I love the Finesse Charcoal Embroidered but there are so many lovely choices. I love the Sasha pink luxury floral duvet set, perfect for my newly refurbished bedroom. Many thanks for running this lovely giveaway. I am in love with the Ashford Silver Luxury Duvet Set. My favourite is the Harmony Floral Reversible Luxury duvet set. Cleo is my favourite, so crisp and indulgent. Love the Cleo, nothing like luxury white bed linen to slip into.